If the country were ever faced with an immediate threat of nuclear war, a copy of this booklet would be distributed to every household as part of a public information campaign which would include announcements on television and radio and in the press. The booklet has been designed for free and general distribution in that event. It is being placed on sale now for those who wish to know what they would be advised to do at such a time. If Britain is attacked by nuclear bombs or by missiles, we do not know what targets will be chosen or how severe the assault will be. If nuclear weapons are used on a large scale, those of us living in the country areas might be exposed to as great a risk as those in the towns. The radioactive dust, falling where the wind blows it, will bring the most widespread dangers of all. No part of the United Kingdom can be considered safe from both the direct effects of the weapons and the resultant fall-out. The dangers which you and your family will face in this situation can be reduced if you do as this booklet describes. The heat and blast are so severe that they can kill, and destroy buildings, for up to five miles from the explosion. Beyond that, there can be severe damage. Fall-out is dust that is sucked up from the ground by the explosion. It can be deadly dangerous. It rises high in the air and can be carried by the winds for hundreds of miles before falling to the ground. The radiation from this dust is dangerous. It cannot be seen or felt. It has no smell, and it can be detected only by special instruments. Exposure to it can cause sickness and death. If the dust fell on or around your home, the radiation from it would be a danger to you and your family for many days after an explosion. Radiation can penetrate any material, but its intensity is reduced as it passes through - so the thicker and denser the material is, the better. Your own local authority will best be able to help you in war. If you move away - unless you have a place of your own to go to or intend to live with relatives - the authority in your new area will not help you with accommodation or food or other essentials. If you leave, your local authority may need to take your empty house for others to use. The first priority is to provide shelter within your home against radioactive fall-out. Your best protection is to make a fall-out room and build an inner refuge within it. Because of the threat of radiation you and your family may need to live in this room for fourteen days after an attack, almost without leaving it at all. So you must make it as safe as you can, and equip it for your survival. Choose the place furthest from the outside walls and from the roof, or which has the smallest amount of outside wall. The further you can get, within your home, from the radioactive dust that is on or around it, the safer you will be. Use the cellar or basement if there is one. Otherwise use a room, hall or passage on the ground floor. Even the safest room in your home is not safe enough, however. You will need to block up windows in the room, and any other openings, and to make the outside walls thicker, and also to thicken the floor above you, to provide the strongest possible protection against the penetration of radiation. Thick, dense materials are the best, and bricks, concrete or building blocks, timber, boxes of earth, sand, books, and furniture might all be used. If you live in a block of flats there are other factors to consider. If the block is five stories high or more, do not shelter in the top two floors. Make arrangements now with your landlord for alternative shelter accommodation if you can, or with your neighbours on the lower floors, or with relatives or friends. If your flat is in a block of four storeys or less, the basement or ground floor will give you the best protection. Central corridors on lower floors will provide good protection. Bungalows and similar single-storey homes will not give much protection. Arrange to shelter with someone close by if you can do so. If not, select a place in your home that is furthest from the roof and the outside walls, and strengthen it as has been described. If you live in a caravan or other similar accommodation which provides very little protection against fall-out your local authority will be able to advise you on what to do. Still greater protection is necessary in the fall-out room, particularly for the first two days and nights after an attack, when the radiation dangers could be critical. To provide this you should build an inner refuge. This too should be thick-lined with dense materials to resist the radiation, and should be built away from the outside walls. 1. Make a 'lean-to' with sloping doors taken from rooms above or strong boards rested against an inner wall. Prevent them from slipping by fixing a length of wood along the floor. Build further protection of bags or boxes of earth or sand - or books, or even clothing - on the slope of your refuge, and anchor these also against slipping. Partly close the two open ends with boxes of earth or sand, or heavy furniture. 2. Use tables if they are large enough to provide you all with shelter. Surround them and cover them with heavy furniture filled with sand, earth, books or clothing. 3. Use the cupboard under the stairs if it is in your fall-out room. Put bags of earth or sand on the stairs and along the wall of the cupboard. If the stairs are on an outside wall, strengthen the wall outside in the same way to a height of six feet. You will need enough for the family for fourteen days. Each person should drink two pints a day - so for this you will need three and a half gallons each. You should try to stock twice as much water as you are likely to need for drinking, so that you will have enough for washing. You are unlikely to be able to use the mains water supply after an attack - so provide your drinking water beforehand by filling bottles for use in the fall-out room. Store extra water in the bath, in basins and in other containers. Seal or cover all you can. Anything that has fall-out dust on it will be contaminated and dangerous to drink or to eat. You cannot remove radiation from water by boiling it. Stock enough food for fourteen days. Choose foods which can be eaten cold, which keep fresh, and which are tinned or well wrapped. Keep your stocks in a closed cabinet or cupboard. Provide variety. Stock sugar, jams or other sweet foods, cereals, biscuits, meats, vegetables, fruit and fruit juices. Children will need tinned or powdered milk, and babies their normal food as far as is possible. Eat perishable items first. Use your supplies sparingly. Your radio will be your only link with the outside world. So take a spare one with you if you can. Keep any aerial pushed in. You will need to listen for instructions about what to do after the attack and while you remain in your fall-out room. You will need special sanitation arrangements because there will be no water to waste in lavatories. Containers such as polythene buckets, fitted with covers and - if possible - improvised seats. Polythene bag linings for emptying the containers. Strong disinfectant and toilet paper. If you have only one dustbin, use that for toilet waste only. Put all other rubbish in plastic bags or paper until you can take it outside the house. As you plan the fall-out room and the inner refuge you need also to limit as far as you can the dangers from heat and blast to the rest of the house. Though the heat could not ignite the bricks and stone of your home it could set alight the contents by striking through unprotected windows. Remove anything which may ignite and burn easily (paper and cardboard, for example) from attic and upper rooms where fire is most likely. Remove net curtains or thin materials from windows - but leave heavy curtains and blinds as these can be drawn before an attack as protection against flying glass. Clear out old newspapers and magazines. Coat windows inside with diluted emulsion paint of a light colour so that they will reflect away much of the heat flash, even if the blast which will follow is to shatter them. If you have a home fire extinguisher - keep it handy. Keep buckets of water ready on each floor. Remove boxes, firewood and materials which will burn easily which are close to the outside of the house. Keep any remaining doors closed to help prevent the spread of fire. In an attack, damage to gas, oil and electricity systems could add serious fire and other hazards. All responsible members of your family should therefore know where and how to turn off gas and electricity at the mains, all gas pilot lights and oil supplies. What you have read so far tells you how to prepare to face a nuclear explosion. What follows tells you how to use the protection you have provided. When an air attack is expected the sirens will sound a rising and falling note. The warning will also be broadcast on the radio. When there is danger from fall-out you will hear three loud bangs or three whistles in quick succession. When the immediate danger from both air attack and fall-out has passed, the sirens will sound a steady note. Send the children to the fall-out room. Turn off the gas and electricity at the mains; turn off all pilot lights. Turn off oil supplies. Close stoves, damp down fires. Go to the fall-out room. If you can reach home in a couple of minutes try to do so. If your are at work, or elsewhere, and cannot reach home within a couple of minutes, take cover where you are or in any nearby building. If you are in the open and cannot get home within a couple of minutes, go immediately to the nearest building. If there is no building nearby and you cannot reach one within a couple of minutes, use any kind of cover, or lie flat (in a ditch) and cover the exposed skin of the head and hands. Light and heat from an explosion will last for up to twenty seconds, but blast waves may take up to a minute to reach you. If after ten minutes there has been no blast wave, take cover in the nearest building. After a nuclear attack, there will be a short period before fall-out starts to descend. Use this time to do essential tasks. This is what you should do. Check that gas, electricity and other fuel supplies and all pilot lights are turned off. Go round the house and put out any small fires using mains water if you can. If anyone's clothing catches fire, lay them on the floor and roll them in a blanket, rug or thick coat. If the mains water is still available also replenish water reserves. Then turn off at mains. If the water supply is interrupted extinguish water heaters and boilers (including hearth fires with back boilers). Turn off all taps. If there is structural damage from the attack you may have some time before a fall-out warning to do minor jobs to keep out the weather using curtains or sheets to cover broken windows or holes. If there is time, help neighbours in need, but listen for the fall-out warning and be ready to return to the fall-out room. If you are out of doors, take the nearest and best available cover as quickly as possible, wiping all the dust you can from your skin and clothing at the entrance to the building in which you shelter. All at home must go to the fall-out room and stay inside the inner refuge, keeping the radio tuned for Government advice and instructions. The dangers will be so intense that you may all need to stay inside your inner refuge in the fall-out room for at least forty-eight hours. If you need to go to the lavatory, or to replenish food or water supplies, do not stay outside your refuge for a second longer than is necessary. After forty-eight hours the danger from fall-out will lessen -but you could still be risking your life by exposure to it. The longer you spend in your refuge the better. Listen to your radio. DO NOT GO OUTSIDE until the radio tells you it is safe to do so. Visits outside the house may at first be limited to a few minutes for essential duties. These should be done by people over thirty where possible. They should avoid bringing dust into the house, keeping separate stout shoes or boots for outdoors if they can, and always wiping them. Listen to your radio for information about the services and facilities as they become available and about the type of cases which are to be treated as urgent. If a death occurs while you are confined to the fall-out room place the body in another room and cover it as securely as possible. Attach an identification. You should receive radio instructions on what to do next. If no instructions have been given within five days, you should temporarily bury the body as soon as it is safe to go out, and mark the spot. This means there is no longer an immediate danger from air attack and fall-out and you may resume normal activities. Here is a check list, which reminds you of the actions you must take to provide the protection outlined in this booklet. Use the check list systematically, ticking off each item as you deal with it. This will help you to remember all the things you must do. 1. Do you know the warning sounds? 2. Do you know what action you must take when you hear each warning? 3. Have you chosen your fall-out room? 4. Have you blocked up the windows and other openings (e.g. vents, chimney) of your fall-out room? 5. Have you strengthened the outside walls and the floor above your fall-out room? 6. Have you made your inner refuge, inside the fall-out room? 7. Have you strengthened it with dense materials? 8. Have you put the following items in your fall-out room? a) enough water, in sealed or covered containers, to last you and your family for 14 days? b) enough food to last you and your family for 14 days, including tinned or powdered milk for the children, and food for the baby - and a closed cupboard or cabinet in which to store these supplies? c) a portable radio (two if possible) and spare batteries? d) a tin opener, bottle opener, cutlery, crockery and cooking utensils? e) warm clothing and changes of clothing? g) a portable stove and fuel for it? h) torches, with spare bulbs and batteries, candles and matches? n) cleaning materials, including cloths, tissues, brushes, shovels and a box of dry sand? o) improvised lavatory seat, polythene buckets fitted with covers, polythene bag linings, for emptying the containers, strong disinfectant and toilet paper? p) a clock and calendar? 9. Have you made arrangements to cover your extra water supplies in the bath, sink and wash-basin? 10. Have you put the following just outside the fall-out room? a) a dustbin for temporary storage of waste matter? b) a second dustbin for food remains, empty tins and other rubbish? 11. Have you painted all windows that are not blocked up? 12. Have you got rid of all old papers and other junk that can catch fire easily? 13. Have you taken down the net curtains? 14. Have you got buckets of water ready on each floor? 15. It you have a fire extinguisher, is it ready and in working order? 16. Have you sent the children to the fall-out room? 17. Have you turned off the gas and electricity at the mains? 18. Have you turned off all pilot lights and oil supplies? 19. Have you closed the stoves and damped down fires? 20. Have you shut all the windows and drawn the curtains? 21. Have you filled the bath, sink and wash-basin with water, and covered them? 22. Have you remembered to push in any aerial on your radio? 23. Have you checked that the gas and electricity are turned off at the mains, and that all pilot lights and oil supplies are turned off? 24. Have you checked that any small fires in any part of the house have been put out? 25. Have you replenished your water supplies? 26. Have you taped up the handle, or removed the chain, from the lavatory? 27. Have you turned off the water supply at the mains? 28. Have you checked your survival kit? 29. Have you done any minor repairs, to keep out the weather? The danger from fall-out is greatest in the first forty-eight hours. During that time you must stay in the fall-out room and as far as possible within your inner refuge. If you leave the room to dispose of waste or to replenish food or water supplies, do not stay outside it for a second longer than is necessary. The longer you spend in your refuge and your fall-out room after a fall-out warning the less the danger to your lives. To listen to your radio. To conserve your stocks of water and of food, and to keep them sealed, covered or wrapped - and close the cupboard door. Water means life. Re-use it for different purposes, using as little as necessary for cooking. Cans of food, pierced through the top, may be heated in a saucepan of water and the same water used several times without cleaning the pan. Used utensils can be cleaned by holding or placing them in the same hot water. To carry out your sanitation arrangements with care. Keep separate containers for lavatory waste and for other rubbish. Keep hands as clean as possible. When an air attack is expected, the sirens will sound a rising and falling note. When there is danger from fall-out you will hear three loud bangs or whistles in quick succession. When the immediate danger from both air attack and fall-out has passed. the sirens will sound a steady note. A booklet, Nuclear Weapons (ISBN 0 II 340557 X), published by Her Majesty's Stationery Office, is also available. 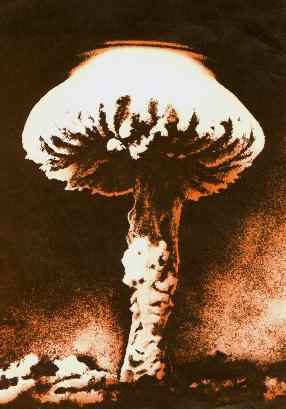 It contains detailed information about the effects of nuclear weapons and will be of interest to those who wish to further their knowledge of the subject. A leaflet, Domestic Nuclear Shelters, also published by Her Majesty's Stationery Office, is available. This includes advice on domestic shelters providing protection against nuclear explosions. Printed in England for Her Majesty's Stationary Office by UDO Litho Ltd. This document is believed to be in the public domain and was transferred to the Internet by George Coney.